A beautifully crafted and poignant coming of age story where loyalties will be divided, friendships will be tested, teenage love will be discovered, and through it all, the enduring bond between a boy and his beloved dog will always be remembered. This was supposed to be a simple summer for Billy: one more lazy expanse of time before college began. He'd fill the hours playing with Jimmy - his canine best buddy - going camping and doing all the things he promised Jimmy they'd do before Billy left. But that was before the accident that shook the entire town. It was before the summer job that turned into something so much more than a way to get a paycheck. And it was before Vicki. This summer was destined to be many things to Billy, things he didn't truly understand until now. But it was definitely not going to be simple. "Manchester's The Changing Season will be to young adults what Old Yeller is to my grandson." Steve writes such beautiful books. His books are well written and contain many life lessons. They are clean, wholesome, and meaningful. 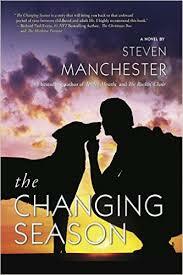 The Changing Season is on my to read very soon book list.